She looked at him wonderingly and at length, remembering other women’s acquiescence to an awkward suitor’s prologue to marriage: girlish smiles and laughter following some artless boy’s long-limbed shuffling and shy proposals. In all her imaginings of a sober and practical union, the breeding of children, and the laboring drudgery of a woman’s sphere, she had never dared hope for the promise of this; that a man would take her knowingly for all her mannish, off-putting certitudes and canny will, her prickly refusals to adhere to womanly scrapings, her ferocious and ill-tempered nature. In The Wolves of Andover, it’s 17th century Massachusetts and 23-year-old Martha Allen moves to Andover to help her cousin take care of the household and children. There she meets hired hand Thomas Carrier who’s rumored to have had a major role in the murder of Charles I in England. The pair complements each other. Martha Allen certainly stands apart for this time as an outspoken, bold woman who doesn’t apologize for her behaviors and thoughts. It’s refreshing. Thomas Carrier possesses physical strength and strong convictions. He has an unusual past that slowly unfolds as Martha spends more time with him. 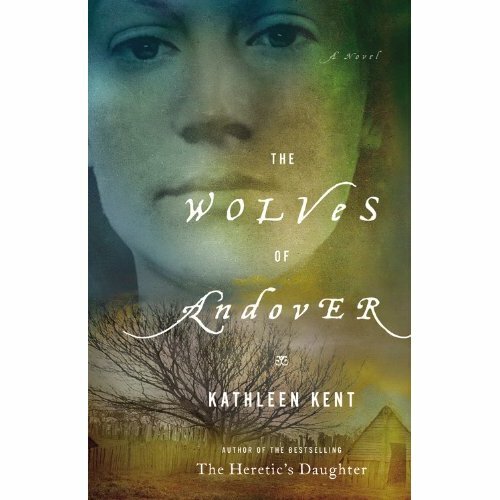 The Wolves of Andover serves as a prequel to author Kathleen Kent’s The Heretic’s Daughter although I didn’t even realize it until I had gotten about one-third of the way through. Kent writes so skillfully that it doesn’t matter which order you read the novels. I really liked The Wolves of Andover for a number of reasons. It provides a detailed, rich description of daily life in 17th century Massachusetts. Smallpox travels through the town and I’m fascinated by infectious disease and how it’s contained. Kent takes the reader to England for its civil war. And the wolves? There are two kinds of wolves in this novel and they are sneaky and vicious. Kent clearly knows how to craft a scintillating work of historical fiction. Plenty of research, historical content and intriguing characters and a mysterious plot propel The Wolves of Andover.